Jacob Young (gtrs); Trygve Seim (ten/sop); Marcin Wasilewski (pno); Slawomir Kurkiewicz (bs); Michal Miskiewicz (dms). Graceful, harmonically rich and rhythmically alert jazz is how the notes describe Forever Young and it sums up the album so well I could almost close without saying more. However, to do so would be a disservice to the Norwegian guitarist, fellow countryman Seim and the Polish rhythm section. Young is the most tasteful of guitarists, whether on acoustic or electric always managing to find that lyrical phrase or voicing that eludes so many contemporary players. The fact that he also composed the pieces is of course to his advantage - you don't invent a game to get beat at it as the saying goes. Seim too can turn on the charm - no barnyard noises from Trygve but a sound that is pure satin albeit not without attitude. The Wasilewski Trio are no mere rhythm section but an integral part of the music blending seamlessly with Young and Seim. Wasilewski's solos are up there with them, relaxed, exploring and so listenable. Young, as well as paying his dues on the New York scene some 20 years ago, also visited Brazil which greatly influenced both his playing and composing and is very much in evidence on the two opening tracks. An album well worth checking out. If lyricism is your bag - they've got sackfuls of it. 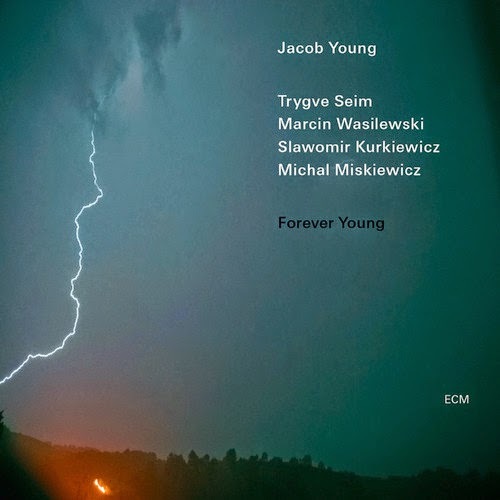 Jacob Young: Forever Young is available now on ECM 3768896.